This week, at one of the foremost rural educational events in the UK, 1500 first school pupils from Northumberland and North Tyneside were given an in-depth insight into life in the country. They learnt that chickens don’t have nuggets, that houses can be built of straw, that bacon is not from a packet, and that a horse’s bed can be made from a tree. 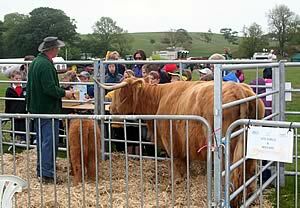 This was at the 2009 Children's Countryside Day at Wooler in Northumberland organised by Glendale Agricultural Society (GAS). This event which is absolutely free to pupils is always one of the highlights of the schools’ calendars. The committee, of this, one of the smallest agricultural societies in the UK, are all custodians of the countryside and passionate about teaching children the importance of farming to their day to day lives. They held their first event five years ago and have now educated in the region of 7000 children. To ensure that they connect the curriculum to the countryside, each year they choose a specific theme for schools to research prior to their visit and this year the chosen topic was Climate Change. 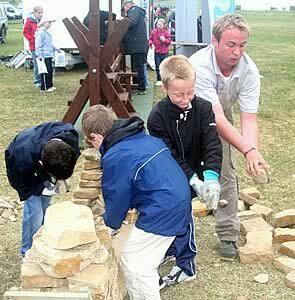 During the day the Children visit over 50 exhibits and learn about every aspect of farming and rural life. This year they learnt how farming practices are being adapted to face the challenges and opportunities of our changing climate. Demonstrations covered everything from the plight of the honey bee to planting hedges to prevent wind erosion to encouraging wildlife into the school playground. They helped to build stone walls, cure bacon, auction sheep, milk cows and quarry like the Anglo Saxons. "Whatever their age or ability I know that through this educational event they will have learnt something new about the source of their food, rural life and the effects of a changing climate,” says Johnny Renner, Chair of the Children’s Day Committee. Cheviot Futures, the main supporter of this year’s event looked at some of the practical ways of addressing the challenges that climate change is causing for local farmers. Peter Kerr, Local Levy Programme Manager said, "Cheviot Futures was represented by Northumberland National Park Authority, the Fenton Centre and the Environment Agency. We talked to the children about different aspects of climate change, from flooding and their memories of the September 2008 floods to how to manage rural land to reduce the risks of flooding and other climate change impacts such as drought or wildfires." "Cheviot Futures is about bringing people from different backgrounds and with different expertise together to work towards stronger and more adaptable communities in rural Northumberland and children are a part of the jigsaw. They are tomorrow's decision-makers and we can use days like The Countryside Day to provide them with the knowledge they need to make decisions about their future." Tarmac Ltd looked at quarrying methods past and present with the help of a live Anglo-Saxon family and showing pupils why quarries make excellent biodiversity sites. Thanks to the North East Regional Food Group, children saw the entire process of food production from pigs in their pens, to them being auctioned at the market, then butchered and cured for bacon.